Boutique, Chic, and All Barge Lady Approved! The boutique hotels of Paris are of interest to all of the Barge Ladies. With every visit, we stay in new ones to share our experiences and recommendations with you. Please note that we do not receive special discounts or better rates with these (or any) hotels. For the best rates, contact the hotels directly using the websites we provide. For any non-refundable rooms, we encourage you to add the reservation to your travel insurance policy. The city of Paris is divided into 20 different neighborhoods called arrondissements, which are named according to their number. For example, you might live in the 5th arrondissement, which would be written as 5ème (or 5e) in French. All of the arrondissements have their own character, style, and ambiance. As a general rule, the closer you are the River Seine, the more touristy the area, and more expensive the hotel. Paris hotel rooms are notoriously small, especially compared to American standards…please keep this in mind! This area is home to some of the major tourist attractions: The Louvre, Les Halles, Jardin des Tuileries, Palais Royal, and the Place Vendome. The architecture in this neighborhood is very regal, and it’s often considered one of the most beautiful areas of Paris. Located off the chic Place Vendome, this is a lovely and classic property. Originally built in 1720 as a private mansion, the building is rich with history. In the 19th century, a prestigious jeweler lived in the Maison, and his influence helped established the nearby Place Vendome as the jewelers district of Paris. In fact, legend has it that valuable jewels were once hidden in the shutters of the building, which are still intact in some parts of the hotel. Today, the hotel offers 57 rooms, each decorated with carefully selected fabrics and furnished with evocative antiques. The light and airy rooms are spacious for Parisian standards, with plenty of closet space, making the Mansart an especially good value. Barge Ladies Ellen and Stephanie stayed at this hotel. Known as the business and garment district, this neighborhood’s historic shopping arcades are filled with trendy boutiques. Known as an area of Paris with quieter nights, it is still reasonably close to the tourist attractions in the 1st Arrondissement. Art, architecture, and history are the main influences of this contemporary style hotel, with a nod to the stylish spirit and timeless sophistication of its surrounding neighborhood. Originally erected in the 19th century, the building was renovated to house 50 hotel rooms, which feature stunning Art Deco details such as velvet floor to ceiling curtains, industrial copper detailing, and antique Parisian tapestries. Unique to the Hotel Square Louvois is an indoor swimming pool found in the property’s underground stone vaults, adding a tranquil benefit to your stay. Barge Ladies Kelly and Stephanie stayed at this hotel. As the oldest neighborhood in Paris, this area has re-invented itself many times, and today retains several identities. It the city’s epicenter of cool, with hip boutiques, designer hotels, and art galleries galore; and, though fading, the nucleus of Jewish life. As the only hotel nestled within the peaceful Place de Vosges, often referred to the as the most beautiful square in the world, the Pavilion de la Reine is a serene haven from the hustle and bustle of city life. The ivy clad exterior and private courtyard garden awash with greenery welcome guests to the 17th century property. Inside, the décor is a combination of contemporary style mixed with antique furnishings and exquisite art. The 56 romantic and sophisticated rooms feature plush furniture and luxurious textiles. A deluxe spa and swanky bar add to the discreet luxury for which the hotel is known. Barge Lady Ellen stayed at this hotel. Organized around the Sorbonne University since the school’s origins in the Middle Ages, the Latin Quarter has retained many traces of this erudite past and remains today the academic and intellectual heart of the capital. Its lively streets are now lined by wine shops, produce markets, and artsy movie theaters. As the former home of a family who once played a significant part in the artistic community of the Left Bank, the Hotel Monge has always boasted an address of prestige and significance in the Latin Quarter. The stylish décor creates visual interest through layered colors, intriguing patterns, and rich textures, referencing the cultural depth of the property’s sweeping Parisian history. Interlocking salons, Hungarian point parquet flooring, fireplaces of Carrara marble, exquisite furniture, and tropical themed wallpapers augment the chic design. The property was converted into 30 hotel rooms in 2016, and also offers an onsite spa. As the city’s artistic hub, the streets of Saint-Germain-des-Prés are lined with upscale art galleries, storied cafés, designer boutiques, atmospheric restaurants, and a fine selection of museums. Dating back to the 13th century, the stately Rue de Buci provides a pedigreed address to the Hotel de Buci, a delightful boutique hotel with a total of just 24 rooms and suites. Tucked away in a charming pocket of the neighborhood with the inviting ambiance of its own lively little village, the immediate environs are teeming with petite cafes, niche bookshops, art galleries, and specialty boutiques. Just down the avenue, one is whimsically transported back to the literary heart and intellectual center of Paris for which the 6th Arrondissement is celebrated. Within this stylish and sophisticated setting, a variety of room types and suite sizes at the Hotel de Buci offers a little something for everyone. Barge Lady Ellen stayed at this hotel. Originally built in the 17th century as a stately townhouse, this elegant hotel still retains the building’s vintage spirit by preserving its olden day charms: the tasteful décor includes Versailles parquet, open beams, a monumental fireplace in Burgundy stone, and Aubusson tapestries which inspired the hotel’s name. A café dating back to 1690 occupies the hotel’s lobby, along with a serene interior courtyard and upscale piano bar, all adding to the sophisticated ambiance. The 49 rooms are handsomely appointed, and the hotel’s dedicated concierges are known to be some of the best in Paris. Barge Lady Ellen stayed at this hotel. 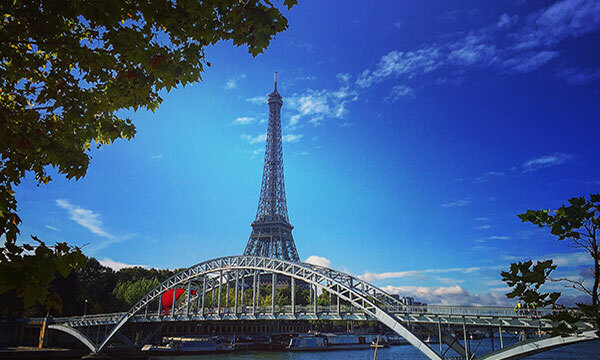 The iconic Eiffel Tower and its Champs de Mars park lie in this genteel district. The area draws tourists to cultural landmarks including the Musée d’Orsay and its Impressionist art collection; the Musée Rodin with its sculpture garden; and Les Invalides, home to Napoleon’s Tomb. Originally constructed circa 1886, the property’s initial purpose was to house the iron workers who bravely constructed the iconic Eiffel Tower. Now a chic boutique hotel, the Londres Eiffel offers its guests 30 glamorous rooms decorated with cheerfully patterned wallpaper and pops of fresh color. The lobby is bright and airy, and there is also an adorable library with an open air reading lounge, providing the perfect perch for guests to relax while they plan their daily excursions. A charming front desk staff is eager to answer questions and make suggestions. Barge Lady Stephanie stayed at this hotel. One of the largest arrondissements, the 17th is known as an affluent area for residents, and lies slightly off the tourist path. There are no major sights or museums here, rather exquisitely authentic Haussmannian architecture, real French people, and an ambiance of quintessential Paris. This neighborhood is close to a series of other villages, including the Batignolles district, with charming streets teeming with boutiques and cafes that attract bohemian crowds, and the Montmarte district, a hilltop neighborhood with cobblestone streets, and lively plazas resting at the foot of its pilgrimage-worthy basilica, Sacre Coeur. Also close are the imposing boulevards that converge at Place Charles de Gaulle, the starting point of the Champs Elysées. Tucked away on very quiet residential blocks is a hotel that opened in March of 2017. The 58 stylish rooms offer various sizes and accommodations for everyone, and the décor is soothing and elegant. Its relaxed architecture evokes the shapes of Haussmann buildings, with a signature Art Deco style. Unique to this hotel is a wine cellar that has an elaborate tasting room, where guests can sample a wide range of wines and spirits. Choose your preferred wine at the ideal temperature with customizable servings. Barge Lady Caroline stayed at this hotel and enthusiastically suggests it for people that are interested in staying in a residential area.